Over two decades of residential and small commercial experience makes Pine Valley Plumbing, Inc. an expert in remodeling. Whether you are adding a laundry room sink or an entire new addition, our knowledge can provide you with qualified insight, new ideas, and help your project run smoothly. We use top of the line products such as Kohler, Moen, Delta, Grohe, Toto, American Standard, and Bradford White and can recommend products that fit any style and budget. Pine Valley Plumbing can help you optimize your plumbing system with products such as water softeners and filters that may help prevent damage to your plumbing system over time and can help you identify products such as on-demand water heaters that are not only energy efficient but often qualify for generous rebates. Our qualified plumbers will provide you with a quality job and a clean jobsite. Our company always maintains all licenses, bonds, and insurance and is a proud member of the COBA Remodelers Council. 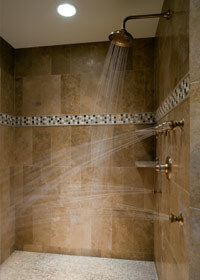 Pine Valley Plumbing is excited to let our expertise improve your home or office. Pine Valley Plumbing offers leaky pipe repair, installation and repair of toilets, sinks, faucets, garbage disposals, hose bibs, recirculation pumps, booster pumps, water and sewer mains, and in-home plumbing inspections. We install and repair gas, electric, and tankless water heaters, change out elements and thermostats, and can provide you with energy rebate information on qualifying new installations. Call us today at 541-385-8709 with questions, comments, or for more information. You may also contact us online for more information on our plumbing services. Providing all types of plumbing and water heater services to Bend, Sunriver, Redmond, Sisters, and the surrounding Central Oregon areas.